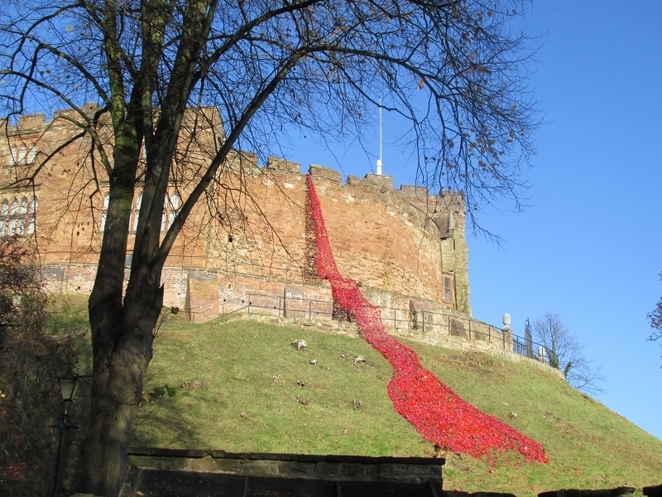 Medieval Tamworth Castle in Staffordshire is enjoying a new link with history after unveiling a colourful tribute which commemorates the end of World War One. 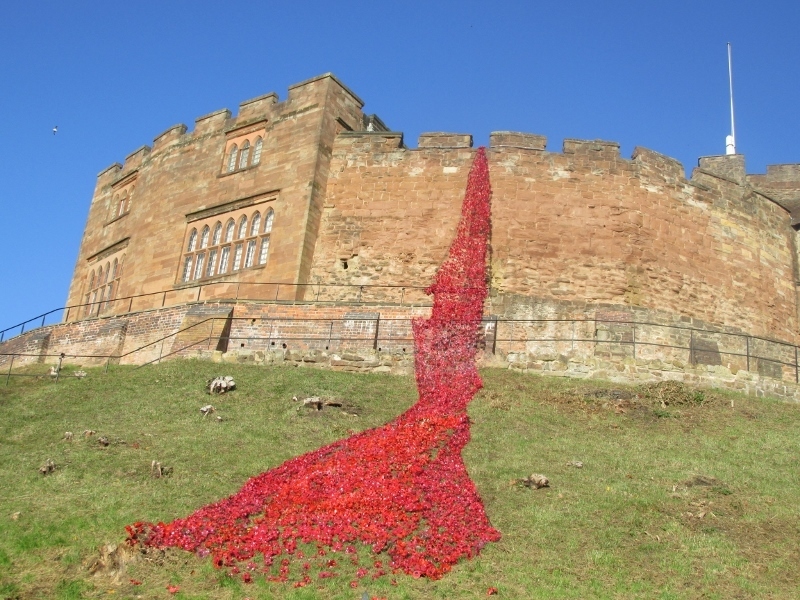 The imposing grade l listed Norman castle, which replaced the original Anglo Saxon earthen burgh, revealed a striking poppy cascade on Sunday 11th November to mark both Remembrance Sunday and the centenary of the Armistice which officially brought the First World War to an end in November 1918. The extra special display was unveiled after the traditional Remembrance Day parade culminated in Tamworth Castle Grounds. The parade, which was led by Coventry Jaguar Band, consisted of various standards, former servicemen and women, DMS Whittington, sea cadets, army cadets, air training corps, police, fire service, St John Ambulance, scouts, cubs, guides, brownies and the boys' brigade. As soon as the procession arrived at the Castle Grounds, the cascade of thousands of poppies was hung from the battlements at the top of the formidable stone structure. This was done against a musical accompaniment from the combined voices of the Mercian Singers, Tamworth Voices and Tamworth Ladies Choir. The poppy cascade was the result of an impressive community project which brought people from across Tamworth together to make poppies out of used plastic bottles. Thousands of poppies were created and attached to nets which were hung from the top of the castle. The joint project involved Tamworth Borough Council's Arts & Events team, Tamworth Castle and Tamworth Ladymeadow WI, which led the poppy-making efforts. However, other contributors included local guides and brownies, pupils from Flax Hill Junior, Birds Bush Primary and Two Rivers High schools, Tamworth Community Together CIC, Bright Crescent sheltered housing residents, the George Bryan Centre, Briars Barn, St John Ambulance, other WI groups and people of all ages across the town who took up the challenge of making poppies at home. Weather permitting, the intention is for the cascade to remain in place for a few days before being taken down and kept for future display and use in events. Councillor John Chesworth, the Cabinet member for Culture and Operational Services, described the 'We Will Remember' display as a "truly poignant spectacle". He said: "The poppyfying has been a wonderful community project and to have so many people coming together to work on it is a lovely tribute to those who fought for this country all those years ago. A lot of hard work has gone into the cascade, especially by the members of Tamworth Ladymeadow WI, who agreed to take on the ambitious challenge many months ago. 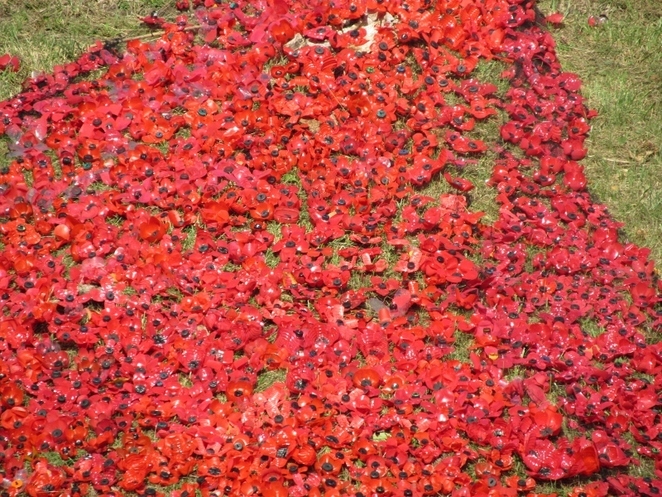 The aim was to create 4,000 poppies and thanks to their time and effort and the valuable help they've received from community groups and members of the public, that target has been achieved. There's also the added environmental benefit of plastic bottles being re-used in a community art installation which we will keep for future use." For more information on We Will Remember and other events in the annual programme organised by Tamworth Borough Council's Arts and Events team, please visit www.tamworthartsandevents.co.uk/whats-on, where you can also sign up to receive all the latest news and offers.